By P. M. H. Atwater, L.H.D. During my first session in 1982 with Mellen-Thomas Benedict about his near-death experience, he used phrases and words to describe it that he now wants clarified. Mellen-Thomas notes that he is not so much a reader as an experiencer in life, a doer, an inventor, who is fascinated by how things can change for the better and what we can do to ensure this. He states that he never had read a single book about near-death states before his experience, and never meant to imply that he did. He spent less and less time working as his condition worsened, because he was sick and in a deep depression. His memory of that fateful morning was that he died at sunrise. 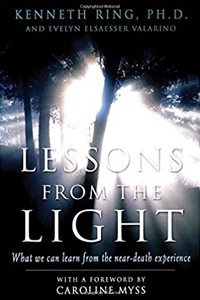 During his near-death experience, just as he reached the Light at the end of the tunnel, he asked the Light: “Can I think about this for a minute?” It was never a “willful” decision on his part. “I was in the presence of Grace and just asked the right question. The Light seemed to be interactive and interested in this fresh new question from a human being.” What he recognized then, while his episode was actually occurring, was that he was an active participant in it. Two hours later his hospice caretaker discovered him and helped him revive. What happened to Mellen-Thomas changes the importance of his narrative. It implies that near-death states may indeed be interactive within the consciousness of the one having it. There is some research, mine and others, to support this implication. I want you all to know about this discrepancy between what I have in print and what Mellen-Thomas now claims. Yes, I have full backup with his signature to everything I originally wrote. Still, I want to acknowledge how, overtime, any of us can alter what we previously said, once we have a better way to convey what we really meant. This is especially true with near-death experiencers! None of us have the language we need to verbalize what happened to us. The near-death phenomenon is beyond words. The case of Mellen-Thomas Benedict is genuine. How he chooses to describe it today makes it even more interesting. I have experiences of people who have learned to interview dream characters and life issues doing so in dreams and thereby changing the dream in an interactive, rather than in an autonomous way, as often is the case with lucid dreaming. I think this is the future of human evolution, and learning to ask questions in any and every state of consciousness is a personal, rather than a prepersonal, approach to evolution. I really don’t understand why the NDE’r that wasn’t ‘He knew he would die the following day and he did …’ ‘He knew what to expect because he’d read many books on the subject (sic)’ chooses to 1. Attempt a ratification of an ‘event’ occurring many years previously, NOW and 2. Thus really rather questioning the credibility of any and all of PM Atwater’s ‘interviews’. I think this is a remarkable story for a number of reasons. 1) There is a witness who presumably can attest that he had apparently died. She must have been extremely surprised when he got out of bed and fell down an hour and half after his apparent death! 2)following his experience, the cancer which killed him vanished. 4) Under hypnosis, was able to give accurate information about and draw the genetic makeup of a rare neuromuscular disease without any scientific background. 5) His explanations of the history and nature of the universe answer a lot of big questions that science cannot. Why? Because science is transfixed with the 1% of the universe it can physically see and not the 99% from which it emerges. 6) There is a logic here that makes total sense to me and correlates closely to my own thinking.